In any reservoir containing fluids or semi-solids, air is breathed in and out as the fluid level changes or as thermal expansion and contraction occurs. Fluid contamination is the primary cause of component wear and lubricant failure in industrial equipment. 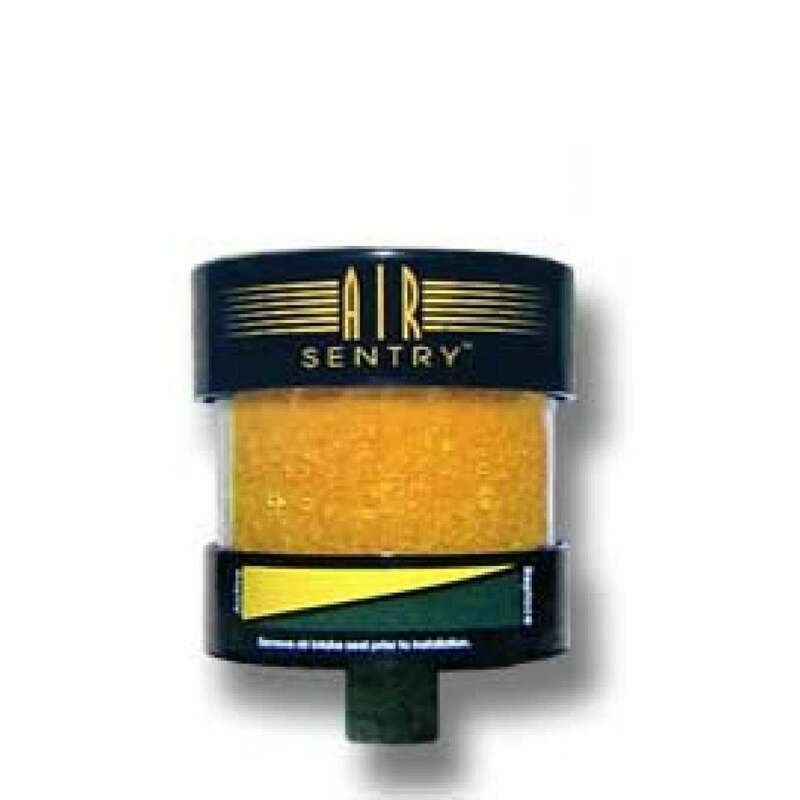 Air Sentry breathers replace the standard breather cap or vent tube on a tank of reservoir. They are easy to install using one of several adapters designed for different applications. When the fluid in the system is lowered, or pressure changes occur, air is drawn in through openings under the breather cap. First, air passes through a fine, 2 micron solid particle filter. The air then passes through a diffuser to ensure maximum effectiveness within the silica gel chamber. Next, water vapor is removed as the air travels through a bed of silica gel - the highest capacity adsorbent available. After being dried, the air passes through a second 2 micron solid particle filter and enters the reservoir clean and dry. Air Sentry breathers use a three-stage filtration design to ensure optimum protection by removing water vapor and solid contaminants before they enter the fluid system. Bi-directional Air Flow - Air entering is cleaned and dried. Expelled air partially regenerates the silica gel and "backflushes" the particulate filter to prolong the life of the breather. Durable Construction - Air Sentry is manufactured from rugged ABS plastic and impact-modified Plexiglas. Water Vapor Adsorbent - The silica gel used in Air Sentry breathers is chemically inert, non-corrosive, and conforms to all regulated toxicity standards in the U.S. and other countries. Microscopic pores allow the silica gel to adsorb up to 40% of its own weight. Color Indicator - When maximum adsorption is reached, the silica gel turns from gold to dark green to indicate that replacement of the breather is required. Activated Carbon - As air is expelled from the tank, it passes through activated carbon which remove oil vapors, fumes, and odors. Safety Sealed - Seals keep moisture from entering the units until they are placed in service. They are easily removed without tools or sharp instruments.